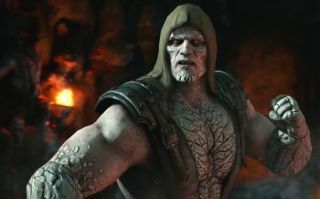 Tremor has turned up in a couple of prior Mortal Kombat games, but Mortal Kombat X will be his first appearance as a fully playable character. His outfit has changed a bit, although it's still clearly based on the Sub Zero-style ninja duds. And while I can't say his fatalities are necessarily "the best" of any I've seen, I'm pretty confident they're among the funniest. The first half of the video is brutal, but otherwise entirely unremarkable and even a bit dull by Mortal Kombat standards. Then Scorpion steps into the ring, there's a spot of ultra-cheesy dialog ("My flame can burn even you!") and the beatdown begins, culminating in a finish that truly made me want to clap my hands. The unexpected capper at the very end was even better. What a way to make a splash! That's right, I said it. Again. Tremor will be available tomorrow for owners of the Kombat Pack DLC bundle, and will go on sale separately on July 28.